Gales, who grew up in Calgary, noted he grew up with the types of characters in the show. “I played hockey, but I’m probably more of a hick,” he said adding hockey culture inspires a lot of the show. “Jared used to play Junior hockey. He grew up in Listowel, so a lot of people think Letterkeny is Listowel. But Letterkenny is an amalgamation of all the little towns he used to travel to to play,” he observed. Keeso is a familiar face from several TV mini-series including police drama ‘19-2” plus he played a young Don Cherry in a couple series about the renown hockey commentator Don Cherry. 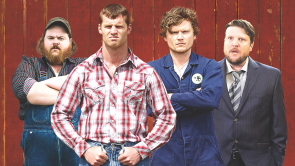 So is Jared Kesso, aka Wayne, really the toughest guy in Letterkenny as he asserts? ‘“He’s actually the kindest, sweetest guy. He works really hard. He could put you down, but he’d rather bring you up,” Dales said, noting the cast doesn’t improv much on the scripts, though the dialogue seems really off the cuff and spontaneous. “Jared and Jacob Tierney writes the scripts, There‘s a little bit of improv, but the scripts are so great, we stick pretty close to them,” he said. Dales also played agent Samansky in Russell Peters’ recent mini-series “the Indian Detective,” which Dales enjoyed doing. “Russell Peters is a great guy. He’s a busy guy. I shot all of my scenes in Toronto, though they traveled all over to shoot the series. I don’t know if they are doing a second season. i hope they are. But he’s really busy on a stand-up comedy tour,” Dales enthused. He is excited to bring Letterkenny back on the road. “ It’s about a group of buddies hanging out together and talking. So who wouldn’t want to do that,” he said, adding the cast is close and even play in a beer league hockey team together. Letterkenny stops by the Enmax Centre, Dec. 14. The show begins at 8 p.m. Tickets are $35, $49.50 or $75.